Residual soils in the northeast Argentina, southeast Paraguay and central and southern Brazil are the result of the weathering of a near-surface basalt formation. To assess the effect of weathering on the small and large strain mechanical properties of residual soils and saprolite, disturbed and undisturbed specimens from the city of Oberá in Northern Argentina were collected and tested in the lab. Soil samples were tested from the surface down to 14 m in depth where a moderated weathered rock stratum was reached. Confined compression tests with complimentary shear wave velocity (S-wave) measurements were performed in all recovered samples. The degree of weathering of each specimen was evaluated by computing the weathering index (WI). The effect of degree of weathering, disturbance, effective stress, natural moisture content and saturation on soil stiffness was evaluated. 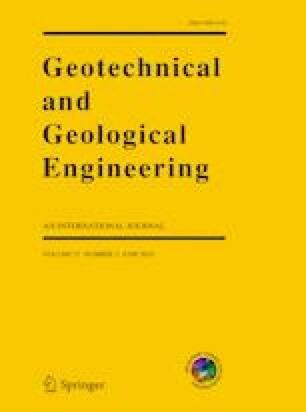 The interpretation of the experimental results indicates that the mechanical behavior of residual soils at high strain levels is mainly controlled by the degree of weathering, the initial void ratio and the effective stress. However, at low strain levels, these soils behave like cemented soils and the stiffness of the skeleton is mainly controlled by the presence of weak bonds between particles caused by the presence of oxides and sesquioxides, and matric suction. To characterize this behavior, a new relationship between WI, effective stress and S-wave velocity is proposed. This relationship can be used to estimate the degree of weathering of residual soils using S-wave velocity measurements. Authors thanks SECyT-UNC, Facultad de Ciencias Exactas Físicas y Naturales, Universidad Nacional de Córdoba (FCEFyN-UNC), Consejo Nacional de Investigaciones Científicas y Técnicas (CONICET) and FONCyT (PICT-2014-3101) for the support of this research. G.O.B. thanks CONICET for the doctorate fellowship. Authors thank the anonymous reviewers for their valuable comments.